UCT’s engineering services included detailed computer modeling and coating simulation systems — allowing us to conduct precise production/development experiments without sacrificing your costly prototype components. UCT Coatings modeled its application development and production-readiness closely to critical aspects of the Ford Production Part Approval Process (PPAP) and the US Government’s Manufacturing Readiness Level / Technology Readiness Level (MRL/TRL) systems. These methods provide two-fold benefit. First, they guide UCT engineers along through the development requirements all the way to volume production-readiness. Second, they make certain that required documentation exists that complies with UCT’s ISO system and meets or exceeds customer expectation for process and quality control. UCT uses these processes to scale-up sensitive, critical, and volume oriented production work. In cases where expected volumes are low, or the components do not have highly critical requirements, these systems do not need to be used. What is deemed critical is determined by the customer. By using these robust application development tools UCT ensures a quality coating product and process. 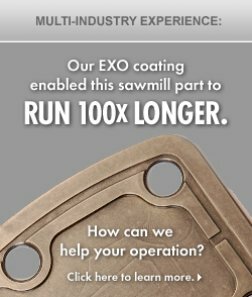 When required the coatings can be certified to specific standards such as ASTM B733, ASTM B607, or our EXO™ material specification TEST 7541-07.